This last weekend was a good one for getting my ToFG Period III models built. First up, here are my Plague Zombies that I will use as a 'counts as' unit of Lesser Daemons in my Blightlord army. I just used a box of WHFB Zombies and used a little bit of green stuff to add some 'Plague Rot' to them. Not much, just a little as I thought the detail of the Zombies themselves woud be good enough. I modelled them to look like they were shambling and reaching out for their prey, what I take as a classic Zombie pose (I am a fan of Zombie movies, go figure). Simple and I really like the way they came out. Only question is how to paint them. I think I am going to paint their flesh the same 'dry death husk' look that I use on my Plaguebearers. 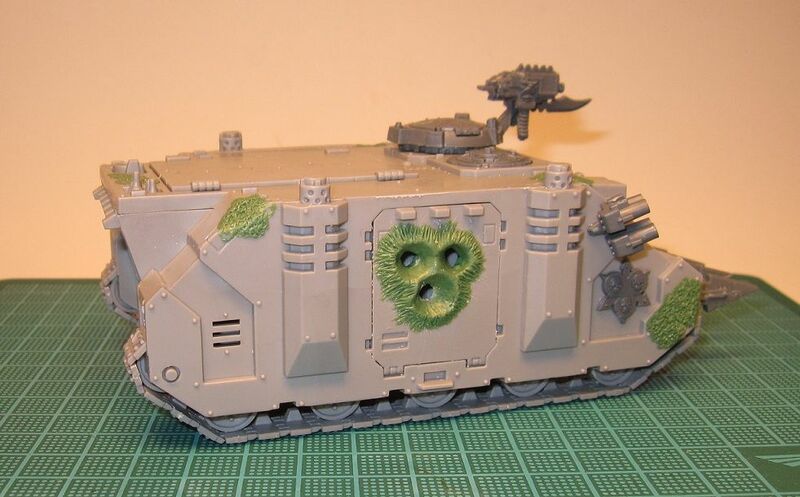 I also got my third Rhino built and I used some green stuff on this one to make it look 'Nurgly'. 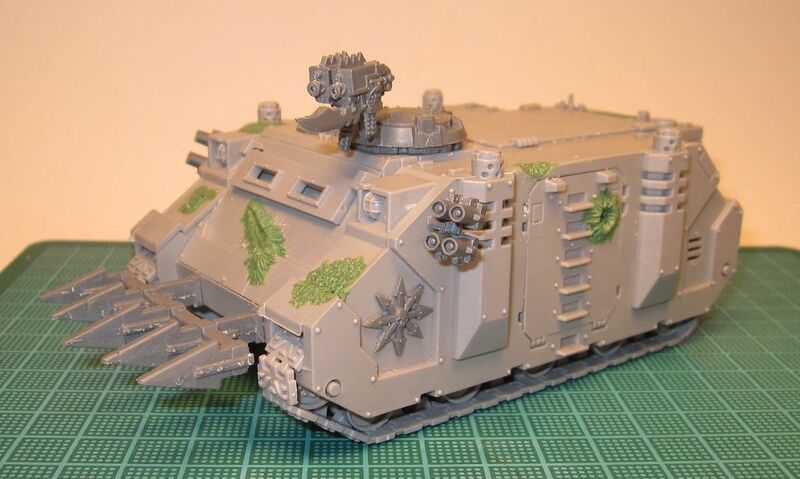 Something I have not done on the first two Rhinos yet. I am not sure where I should go from here. 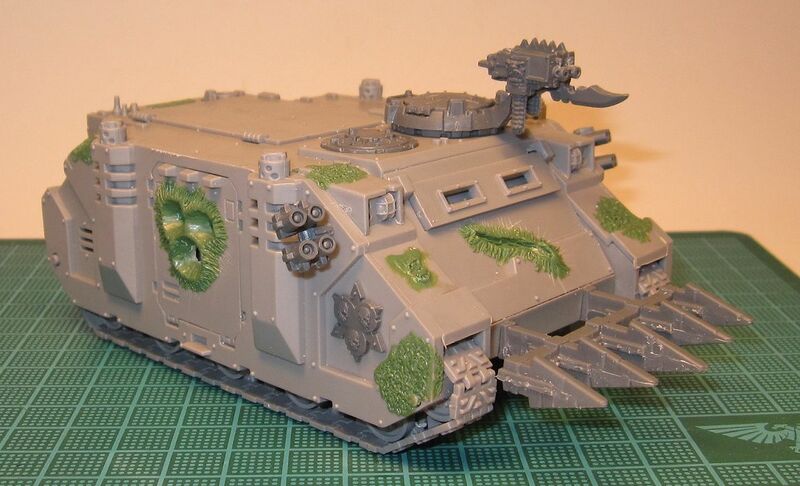 It could be done, or does it need more Chaos bits on it? I am planning to make it dirty and rusted when I paint it, so that may be enough. Tough to decide. Add the additional spiky bitz after you've painted the main hull of the tank, it'll make painting it infinitely easier! @Da Masta Cheef: At this point, I am not sure if I am going to add any spikey bits, but I will keep that in mind. @Anton: Your rhino is awesome. It has given me some more ideas of stuff to do to this one. Thanks! Very cool, I think you have enough detail esp when you will be weathering it in the paint stage. Maybe roughen up some edges as said before. Very nice GS'ing - will look great when finished!! On the subject of the zombies, painting them the same color scheme as plague bearers makes sense: since that's likely where they got the disease in the first place, and it ties them in with the rest of your army. Are you using these as "counts as" something else, or as actual plague zombies for Apoc games? One other thing to consider is mixing the parts from the zombie box with other 40k kits. 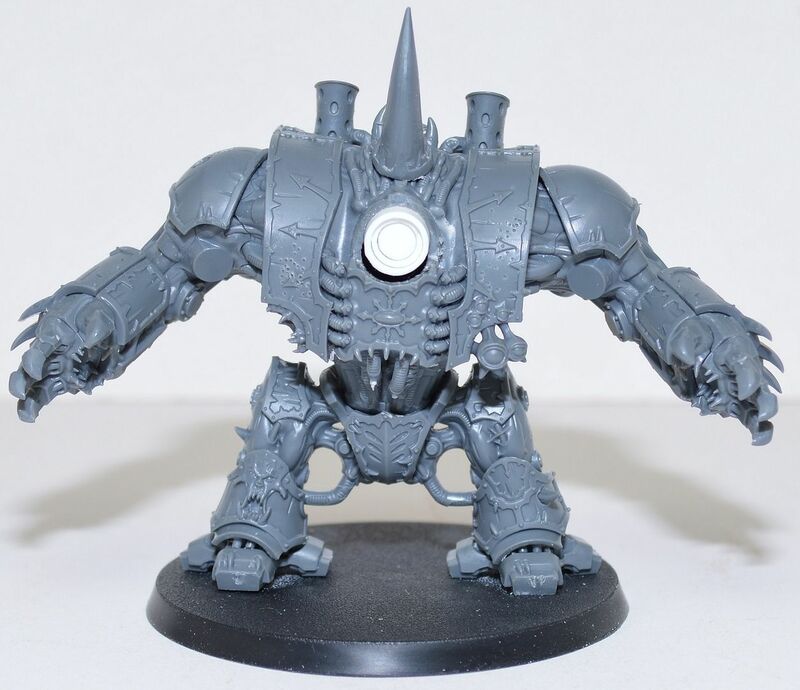 You can often find lots of catachans really cheap online, and it will give them a more futuristic flair. Alternately, if you're willing to spend a little more, a zombie in a cadian helmet is priceless. @Mart: You guys are right, I need to rough it up some more. Thanks for the feedback. @Warhammer39999: I plan to use them as a 'counts as' unit of Lesser Daemons for normal games, and as actual Plague Zombies in APOC. I did want to mix in some Cadian bits, I have a fair amount that I can use left over from my IG army, but I am under a time crunch with the ToFG. I will be making more in the future and will be doing this. @Warhammer39999: You shouldn't have told me it got you to dig around my blog more, now I want to do it even more so I can pad those page view stats. lol. Seriously, I'll keep it in mind for the future.